This delightful, furnished & light-filled studio cottage sleeps 2 and is perfect as a quiet vacation hideaway or relaxing spot to catch up on work. French doors open onto a charming backyard patio & garden with fountains and lemon and orange trees. The Cottage offers a full kitchen with all utensils, glasses & cookware,refrigerator, gas range and oven, & new microwave. Ingenious use of space allows you to use the tiled counter top area as a computer/work space and as a dining area, as well as an extra counter space for preparing your groceries from the nearby markets. The apartment comes with cable TV (]including all premium movie channels), WiFi and broadband DSL, DVD /CD player, all included in the rent. Our queen-size bed features an exceptional Temper-Pedic mattress and a view out to the garden & fruit trees. We also have an electrically-inflatable air mattress if desired. The bathroom features a new corner circular shower and heat lamp. And next to the bougainvillea in the backyard, there's a convenient washer-dryer cabana. Plenty of curbside parking, too! Entertainment journalist, author and filmmaker. Harvard College graduate. Passions include film, piano, literature (Shakespeare especially), Italy and travel. Speaker of English, Italian, some French and German. A TERRIFIC AREA where the traffic and parking is not nearly as congested and stressful as at the beach traffic yet is only minutes away from the ocean. We're also right amongst the cafes, cinemas, boutiques and shopping of the wonderful West side. A great location in what is already a world-class 'destination location.' Lovely backyard and patio, too! Complementary use of our bikes to ride to the beach or explore the neighborhood -- or simply take the beach bus on the corner. Peaceful and quiet backyard terra-cotta patio (with charcoal BBQ) framed by bougainvillea and fountains looking out onto our lovely backyard garden and fruit trees. Complementary high-speed (6 megabyte) internet & Wi-Fi & cable HDTV. During your home orientation when you arrive, James can also serve as your 'virtual concierge' to help you plan your stay in LA. The bathroom features a corner circular shower and heat lamp. And next to the bougainvillea in the backyard, there's a convenient washer-dryer cabana which is shared with the main house next door. We have a full kitchen including refrigerator and four-burner stove and plenty of counterspace! We have bikes on the property as an optional amenity for our guests, available on a first-come, first-served basis. This is a cute little cottage behind a main house. There’s a nice garden to enjoy in the back which, unfortunately, we were unable to enjoy due to rain. The owner and property manager are very helpful. We have a son and family in this area so it was ideal for us! Used the buses a lot. Coffee shop was very good (can’t remember name). If you aren't planning on spending a lot of time at this rental, it is in a central location and the price is right. 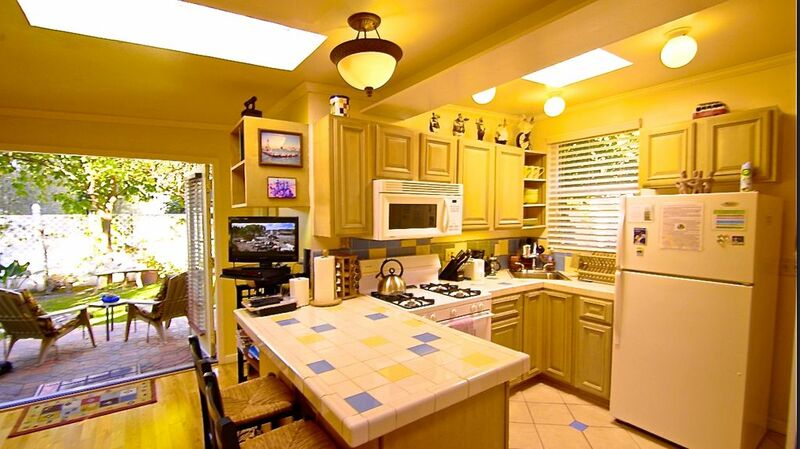 The kitchen is stocked with all amenities you need to cook which is a great benefit. Bed linens and towels are old, shower is a small stall with old leaky fixtures. Backyard access shown is not actually available to use if you have a pet at this pet friendly property. Ok stay but not great. It was a pleasure to stay here. close to many locations and tucked in a nice quiet area. Everything was great. From our lovely 2-bedroom home it's just 5 minutes to the freeways, 6 minutes to the famous Venice Beach and Venice Canals, and 8 minutes to the Santa Monica Pier and Santa Monica promenade. Top-flight restaurants, cinemas, supermarkets, golf course, parks and the Abbott Kinney antique shops are only 4-minutes away. And if you drive down our cross street (passing a convenient supermarket and Costco shopping center) you'll arrive at the fabulous beaches of Santa Monica and Venice in less time than it takes to stroll around the block. A security deposit is required to reserve Beethoven's Cottage, which is charged by HomeAway and is fully refundable by HomeAway following your checkout. All rental rates are for up to 2 guests. $25/night for each additional guest, maximum 3 guests. There is a $80 cleaning fee. We accept Paypal (through which you may also use credit cards), personal or business checks (from U.S. bank accounts only), cash, FOREX wire transfers (for overseas guests), or travelers checks.] No smoking and no pets please. Unfortunately we cannot offer any deposit refunds once a booking is made. We strongly suggest clients procure travel insurance before booking, such as from InsureMyTrip or Travel Guard, in order to avoid any cancellation fees. Call us up and inquire about our special deals.